It will be one of the most memorable days of your son or daughter’s lives and you want to get every part of the day right. Bar or Bat Mitzvah is of course a special day that marks a transition to adulthood. At NY Party Works, we know how important the day is for you. We also know that the amount of planning can be overwhelming. NY Party Works is here to help. We’ve been in the event planning business since 1993. We can provide you with many of the things that you’ll need to make an unforgettable day and we’ll work within your budget. We can help you plan every aspect of the celebration and we can provide entertainment, help with the decor and delight your guests with rentals and souvenirs related to the day. According to the website My Jewish Learning, it’s a good idea to book the location and entertainment for your Bar/Bat Mitzvah a year in advance of your celebration. Once you’ve done that, you need to select a theme and color scheme for the event. NY Party Works would like you to know how we can help bring your theme into focus. NY Party Works can help make your vision a reality. We can also help put the entire celebration together with Total Event Planning. We can create the entire look of your Bar/ Bat Mitzvah. From Decorating Services to Lighting and Special Effects, we’ll create a cool atmosphere for a coming of age celebration. We’ll provide you with any lounge furniture you need from couches and ottomans to high boys, tables, and bars. And NY Party Works is the place to go for Bar/Bat Mitzvah entertainment. We’ll get your guests, young and old on their feet with our DJs, MCs and Dancers. They’ll come equipped with popular party favors such as funny hats, glow sticks and sunglasses. If you want to go even further with your theme, we can do a Carnival, complete with Magicians and Circus Performers. Most importantly you want to have your party stand out. NY Party Works is always getting the hottest and newest entertainment items out there. Our brand new Space Invader is sure to be a crowd pleaser as well as our Social Media photo booths. 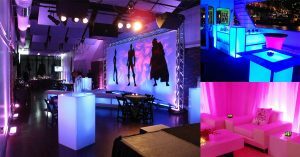 In addition to entertainment, NY Party Works has several rentals that can enhance your Bar/Bat Mitzvah theme. If your son wants a sports theme, we can add games like pop a shot basketball and football. Or try a round of LED Mini Golf. Guests can take home Sports Cards as a memorable keepsake of the day. If your daughter has a fashion theme, our Fashion Illustrator can come and draw your guests fashion magazine illustrations. You can also take pictures in our photo booths or other keepsakes such as personalized backstage passes. Look unique with feather hair extensions, or nail art. When you’re all done share your photos at our Snapchat station. If you’re putting together a Bar/Bat Mitzvah, NY Party Works can help at all stages of planning. We can help you plan every aspect of the event or give you the rentals and services you need to make the day as special as the person who’s coming of age. Whatever budget you’re working with, NY Party Works can make it happen, contact us today. Remember we have the cutting edge entertainment for your party.